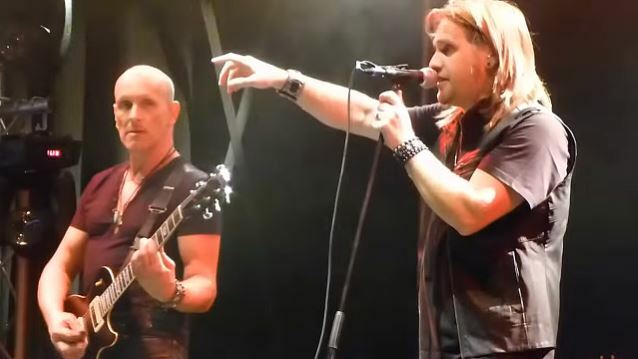 LAST IN LINE — the band featuring DEF LEPPARD guitarist Vivian Campbell alongside fellow founding DIO members Vinny Appice, Jimmy Bain and Claude Schnell, plus singer Andrew Freeman, who has previously fronted HURRICANE and LYNCH MOB — has returned to the studio to put the finishing touches on the songs for its debut album. LAST IN LINE's first CD will be recorded in early January with producer Jeff Pilson — an acclaimed bassist who has played with DIO, FOREIGNER, DOKKEN and T&N, among others — for a tentative spring release via Frontiers. Campbell, who recently left the hospital after undergoing stem-cell treatment in his continuing battle with Hodgkin's lymphoma, says: "It's such a rush to wrestle my Les Paul like this again." An audio snippet of an unmixed version of the song "Devil In Me" from LAST IN LINE can be streamed on the LAST IN LINE Facebook page at this location. Asked by Tickets There how the new LAST IN LINE music is sounding and how the band can avoid DIO's legacy hanging over it, Vivian said: "It's obviously always going to sound a bit like DIO. We're playing those songs that we wrote and recorded. The difference is that Andy doesn't sound anything like Ronnie [James Dio] and that's actually what motivated me to go out and do some gigs. If he'd come in there being a Ronnie clone, I'd have been very disinclined to go any further with it, because I don't want it to just be a tribute to Ronnie's voice. Furthermore, I think that Ronnie is a really, really tough act to try and duplicate. He had such a unique-sounding voice. So the fact that Andy didn't sound anything like him really appealed to me. The reason for that was that it put the focus on the songs and the original band. The focus goes to the guitar, the bass and the drums, and therefore the guys that made the records." He continued: "Not only did we make those records, but what a lot of people don't even realize is that we wrote the songs… obviously, including Ronnie's input, which was monumental, but there was a real sound that we had. The fact that Andy didn't sound like Ronnie somehow resonated with me that it was OK to go out and play those songs and have the focus somewhere else. People then started asking me, 'Are you going to start making new music?' At first, I said no because it was never on my field of thought, but then it became more apparent that for LAST IN LINE to move forward and to be taken to that next level, that's what we needed to do. "We got into the studio just a few [months] ago, in early January and started writing. Just Jimmy, Vinny and myself, and it was so effortless the way we came across new music, it just fell out of us like it did on the first record, on 'Holy Diver'. It was so easy for us to come up with musical ideas. We act as great springboards for each other. Like when I play something for the guys, they instinctively know where to go and vice versa. We came up with a half a dozen song ideas in a matter of days. Then Andy came in and we exchanged vocal and melody ideas." Vivian Campbell's former SWEET SAVAGE bandmate Ray Haller filled in for Jimmy Bain at LAST IN LINE's October 20, 2013 performance at the Loud Park festival at the Saitama Super Arena in Tokyo, Japan. Campbell and Ronnie James Dio worked together on the first three DIO albums — 1983's "Holy Diver", 1984's "The Last in Line" and 1985's "Sacred Heart" — before Irishman Campbell left to join WHITESNAKE in 1987. Post by Last In Line. ROCKwellUnScene.com has uploaded multi-camera video footage of LAST IN LINE performing the song "We Rock" on October 12, 2013 at Ramona Mainstage in Ramona, California. Check it out below. Photos of the concert are available at this location.